Insurance decisions may seem scary, but Bright Choices is designed to make the benefits selection process easy. Takes a portfolio approach to benefits. Instead of going through each plan type decision one-by-one, Bright Choices considers how different benefits products can complement and support one another to provide the right level of financial protection for each individual. Provides a recommendation after getting to know you. Bright Choices goes beyond the standard filtering and sorting of plans based on your specified parameters. It actually learns about your situation, lifestyle and personality – things that are key to determining coverage needs – to recommend the plans that are right for each person. Our suite of tools work together to provide a shopping experience that is effective for each individual. that uses sophisticated statistical modeling to predict the right combination of plans resulting in the best personal fit for each individual. Click on each section of the Recommendation Engine to learn more. 1. Types of plans that match people’s specific needs and wants. 2. A cost that balances premiums with expected out-of-pocket expenses. 3. A match to physician network preferences and overall desires and concerns. A unique recommendation for you built by a system that truly understands who you are as an individual and offers the coverage you actually need. Bright Choices creates a recommended portfolio of benefits that is right for each individual. To do that it needs to ask some simple questions to better understand you. These questions help Bright Choices understand your needs and expectations for health care. Some of the questions asked include: How would you describe your health? How many times a year do you see a doctor? Would you consider a health insurance plan that requires you to see a Primary Care Physician and get a referral for any other non-emergency, in-network care? Building a robust portfolio of benefits is about protecting you from financial risk in case of injury or illness. Everyone is in a different financial situation and has different needs when it comes to protecting their income and savings. This is the portion of Bright Choices that discovers what makes you, you! How comfortable are you with risk? Do you like to be an active participant in your health care decisions? Here is where the Bright Choices engine goes to work. 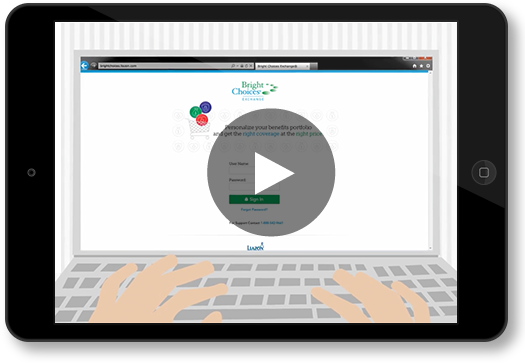 Combining your inputs with the public data, Bright Choices finds the benefits and plans that match your specific needs and wants while minimizing expected cost. Bright Choices relies on public data on medical cost and usage to project health care expenses.